As the anticipation of the World Cup reaches fever pitch (excuse the pun) we turn our attention to the carnival country. A place where the colourful landscape matches the liveliness of the people which fill it, we’re only slightly envious of those jetting off to those sunny climes this week. And that’s not because of their killer seats at the first match between Brazil and Croatia but because of the killer offering of swanky hotels. 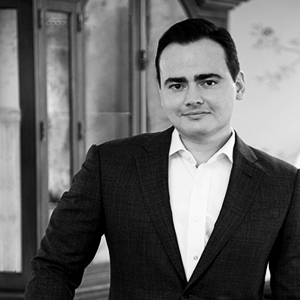 We turned to Daniel Kos, of Daniel Kos Studio, for the inside scoop on Brazil’s most luxurious stays. From views of Christ the Redeemer to rustic fishermen cottages, Daniel covers the best of Brazil as only a true native can. Having been to Rio countless times, I’ve stayed in many hotels, including the iconic Copacabana Palace and the more off-beat Hotel Santa Teresa (both worth a try). However, the Fasano is by far my favourite. Designed by Philippe Starck, it evokes the best of Brazilian design of the 1950s and 60s, with unmistakable Starck quirkiness. Starck uses iconic mid-century pieces mixed with rustic, natural materials to create an incredibly sensual feel. As you can expect, hotels in Rio are as much about the interiors as they are about the views and amenities, and the Fasano does not disappoint. The views from the fabulous roof top pool are probably the best in Rio, and the spa is simply incredible. The interiors of my favourite hotel in Bahia (in the northeast of Brazil) are rustic and inspired by local style, with a clear injection of luxury. The hotel is made up of 10 “casas”, each with special touches. 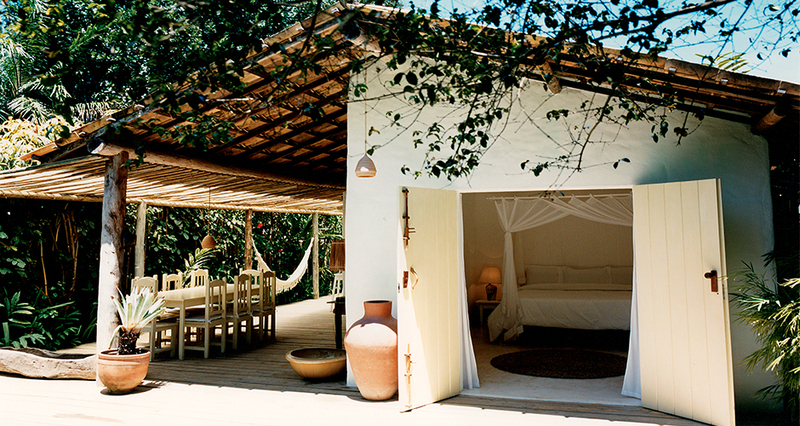 My favourite is casa “Ze e Zilda”, which faces the Quadrado, the historical centre of Trancoso. This traditional fisherman’s house has a very natural and airy feel, with the use of reclaimed wood and locally sourced furniture throughout. The exposed clay roof is painted in white – a modern and very effective detail. The outdoor dining area and cushion-strewn patio make it impossible not to enjoy the indoor/outdoor lifestyle. Ponta dos Ganchos is probably one my favourite areas of Brazil. 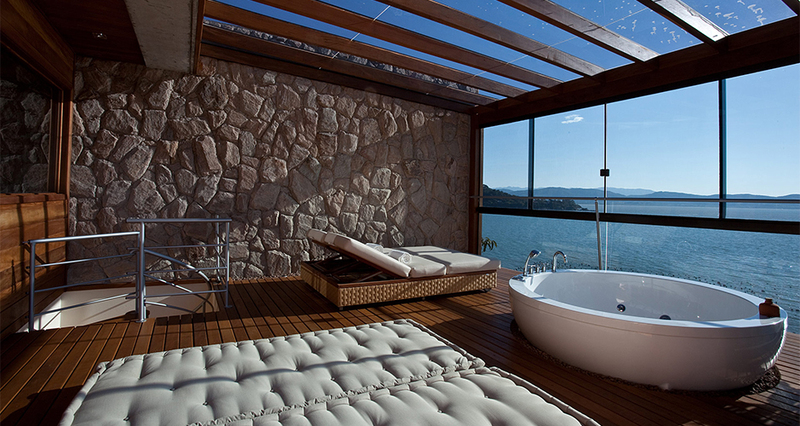 Extremely peaceful, it is perfect for a romantic getaway. You can’t get a bad room in this hotel as even the smallest ones have amazing views and fresh, contemporary and comfortable interiors with a touch of tropical rustic. The extensive use of glass brings in the amazing views while the use of timber, bamboo and stone create interiors that blend well with the outside environment. While the interiors of this hotel tend to be comparatively tame, I cannot resist it and I very much recommend it. The Kenoa resort is located between the forest and the Atlantic, in the state of Alagoas, in the northeast of Brazil. The interiors could be described as chic but low-key, with some ultra-rustic furnishings, modern fixtures and minimalist lines. What really struck me about this hotel was, in the first instance, the exterior, which blends amazingly well with its surroundings, in a strangely modern way. 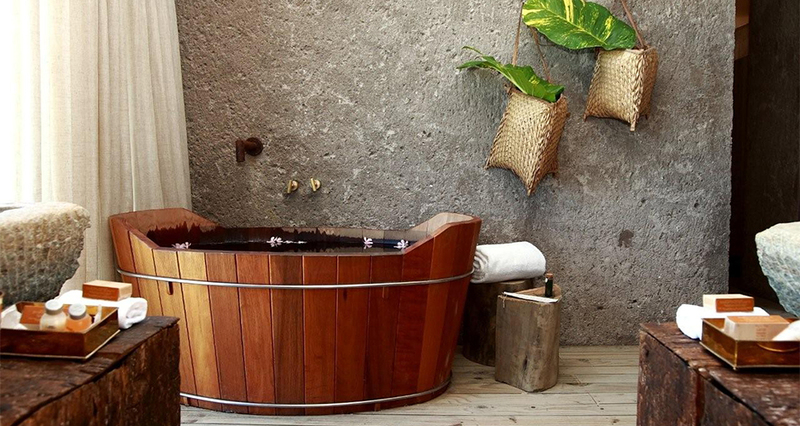 My villa, one of the “Marajo” villas, had the most amazing indoor-outdoor bathroom, with concrete floors, stone walls and reclaimed timber vanities – as well as its own indoor garden. 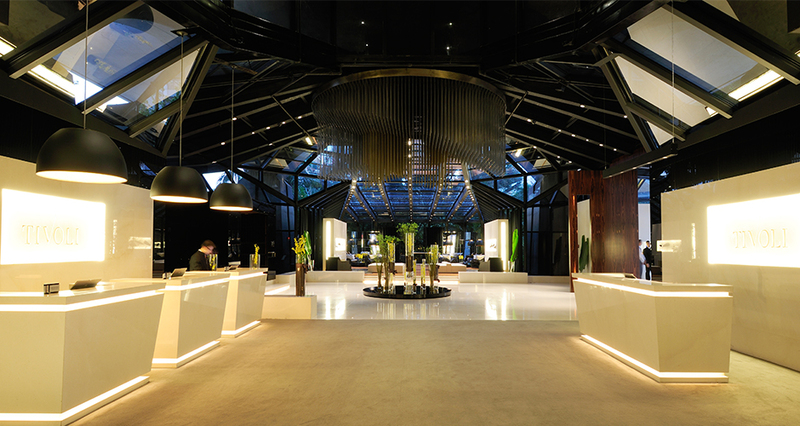 Away from the beach and bang in the urban jungle that is São Paulo, my favourite hotel is Tivoli Mofarrej. The hotel’s rooms and suites are very elegant, contemporary and comfortable, with what I would describe as an international style. 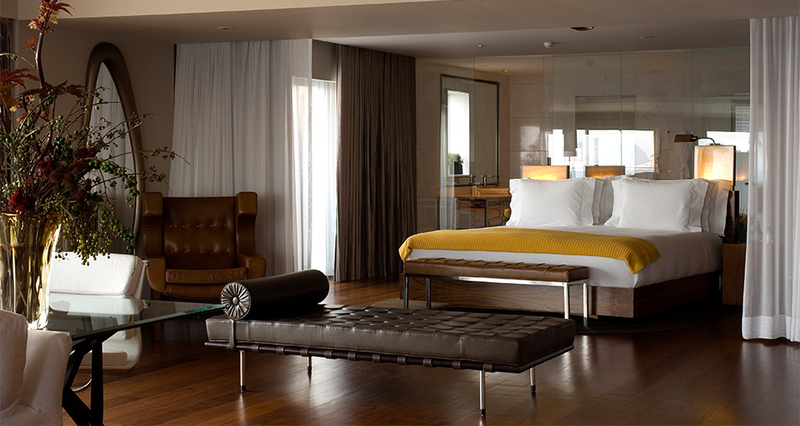 Even though I haven’t stayed in it, I must mention the hotel’s Presidential Suite: it covers an area of 750 square metres (it is the largest in Latin America) and has a 360° view of São Paulo, given that it is located on the 22nd floor and the windows stretch from floor to ceiling. All the rooms are private and the main double room has a bathroom with a spacious Jacuzzi, a double rain shower and a sauna. The suite – which also includes a private kitchen and a fitness room – has private elevator access. Good enough for the likes of Lady Gaga, Paul McCartney and Jennifer Lopez!